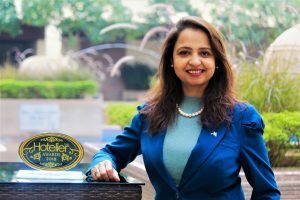 Hotel Jaipur Marriott’s General Manager, Ms. Monica Suri recently bagged the prestigious Hotelier India Award in the category ‘GM of the Year’. Under her able leadership, the hotel has seen growth across various sectors such as revenue generation, reduced attrition, community engagement and staff health, associate welfare, driving diversity and empowerment, among others. In her tenure of 2 years at Jaipur Marriott, the hotel has seen an increase of 55 rooms, 1 night club, 1 restaurant and 2 banquet spaces. Furthermore, Jaipur Marriott now also adorns serious art collections and installations. She has also received the ‘Woman of the Year ‘award in 2017. Now in its 10th year, the Hotelier India Awards recognizes and rewards the achievements of the country’s best talent in the hospitality industry. These Awards acknowledge the efforts of hospitality professionals from different departments – across brands, across hotel categories and across regions – who have worked unstintingly to contribute to their property’s success.